Step back in time to ancient Rome in the comfort of your own home with this exciting, action-packed, historically inspired slot game at wizard. The game will transport you back to a time where the Roman gladiators would fight to the death in dramatic armed combat to thrill and entertain the bloodthirsty audiences of the Roman Empire and the Roman Republic (if you paid attention in history, you may even know the difference!). The battles were violent and vicious confrontations between the gladiators and the gladiators were often up against wild animals, like the ferocious lion you will encounter in Spartacus slot. The two patriots of the game are a glamorous female gladiator and a heroic, Adonis-like male gladiator who are ready for the crowd-pleasing battle. Hold onto your helmet and let the games begin! Spartacus slot game comprises 4 rows and 5 reels and is played over a total of 100 paylines which can be changed, and you can select between 20, 40, 60, 80 or 100 paylines to play across. The game is full to the brim with exciting features to keep you on your toes including advanced symbols, special multiplier features and generous prize spins. In the game, you will come across various themed related symbols, such as the male and female gladiators which are stacked symbols, lions, swords, and gladiator shields and helmets. The aim of this game is to get three matching symbols in a winning combination in order to win, with the stacked symbols giving you a helping hand by replacing all symbols to help complete the winning combination. Read our guide for a list of top 20 UK slot games. Free spins are activated when you land 3 Coliseum symbols and you will be granted 8 spins as well as a twofold multiplier of your total stake. 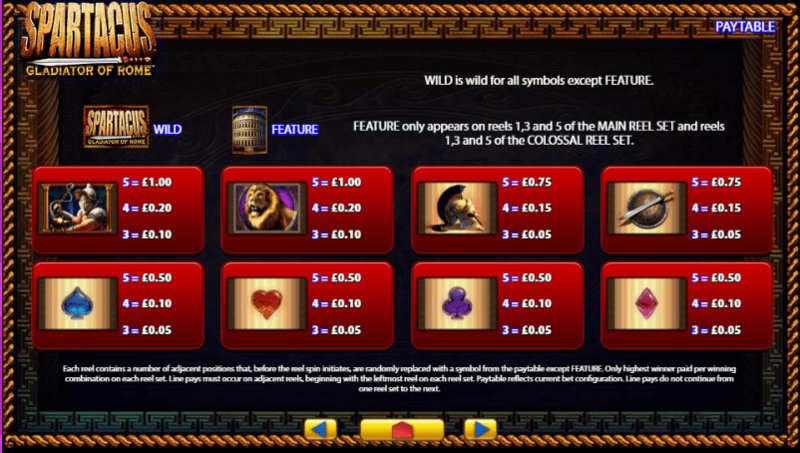 You could be awarded up to 20 free spins and 20 x your total bet if you land 5 Coliseum symbols on the reels, so keep your eyes peels for the lucrative relics. What’s great about Spartacus slot game is that it’s a free to play slot, which is another reason why WMS Gaming’s slot games are so popular with their players. You can give the game a spin or two before you put your hand in your pocket and play for real cash prizes. The historic theme of the game keeps the gameplay interesting and there is a fantastic and entertaining variety of game features to make it a game to remember. 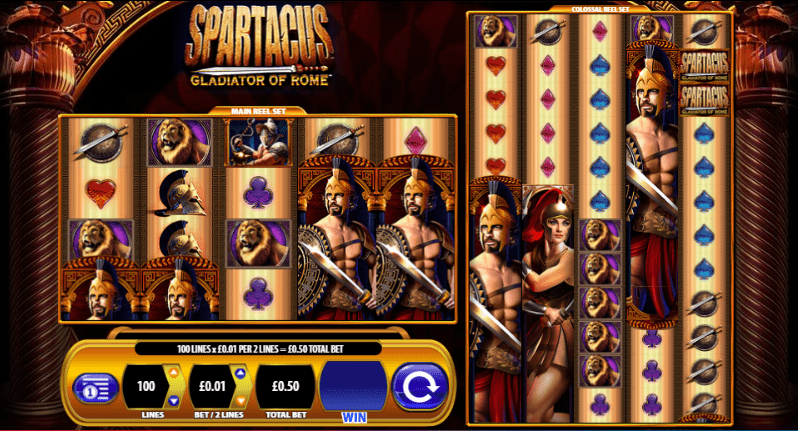 You can take on an epic gladiatorial battle whenever and wherever you are as this slot game is also optimised for mobile and tablet as well as desktop, giving you more opportunities to play and to win. Or visit another time in history with the popular game, Pharaoh.